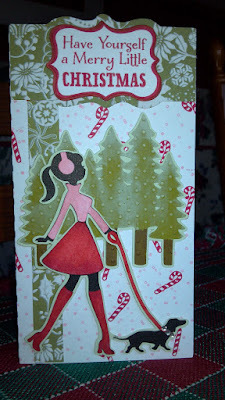 Here is a cute card I made using the Gingerbread from SVGCuts Christmas Cuddly Friends Collection. Instead of using the face cutouts I used face stamps from Peachy Keen, Winter Faces Assortment. The hats they're both wearing are from the Autumn Cuddly Friends Collection. 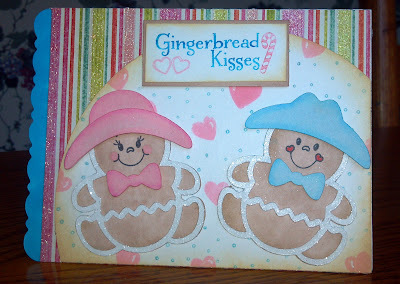 The stamp is from Punkin' Patch's Gingerbread Kisses set, too cute!! I colored in the pieces with my ProMarkers, I'm getting better!! All pieces were cut using Make the Cut software. 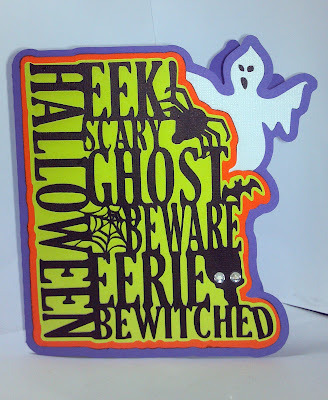 I like the Halloween Word Background on the Cricut cartridge Chic and Scary, so I just had to make my own. Here is my version using Make the Cut, the web, bat, spider, ghost and skull silhouette all came from free halloween fonts. I shadowed the words twice to get the green and orange mats. I then shadowed the orange mat and the ghost to get the card base which I duplicated and welded together. I've uploaded both an svg and an mtc file of the card. The mtc version was done in the beta so if you don't have that installed you will need to use the svg. 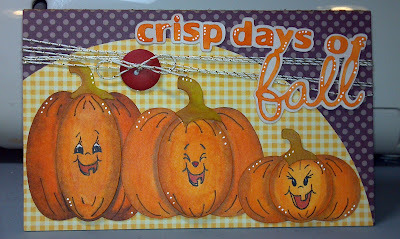 I love the pumpkins from the SVGCuts kit Crisp Days of Fall and thought they would look so cute with some Peachy Keen Faces. I really need to practice more with my ProMarkers, I'm trying to get the blending right. I guess I really need to just sit down and watch some tutorials on it. 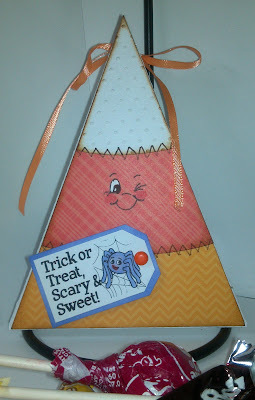 Dania Welch from Stamp Up A Storm, has this really cute project, a witches hat triangle box, click here for her video. Michelle from Michelle My Belle's Creations made a template in Make the Cut and it came out just perfect, you can find it here. 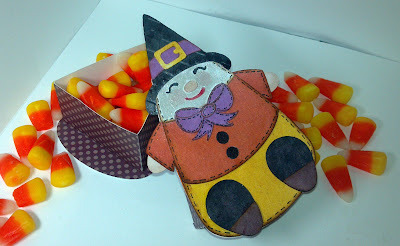 I used it to make this candy corn, it's such a quick and adorable treat box. Make sure you check out both Dania and Michelle's Witches hat, they are just adorable!! I've had the Stampin' Up Sweet Treat Cups since last year and have never used them. 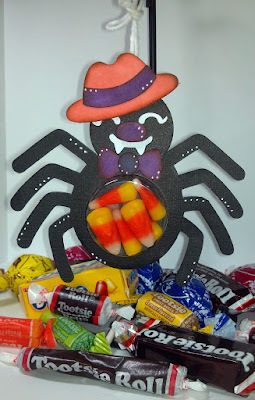 I thought the Spider from SVGCuts.com Halloween Cuddly Characters would be wonderful to use with them. I joined a 1.75" circle with his body using Make the Cut to get the cutout for the sweet treat cup. I cutout two of the body, head and hat, to make it sturdier and also to create a slide in the back of the body to get the candy out. I glued a string between the two hat pieces so it can be hung as a decoration. Here is the back with the slider piece that can be pulled to get the candy out. Check out these new adorable stamps at Punkin Patch!!! I seen these cute lollipop butterflies at skiptomylou.org, and I thought they would be so adorable using the Halloween Cuddly Friends from SVGCuts.com for halloween. 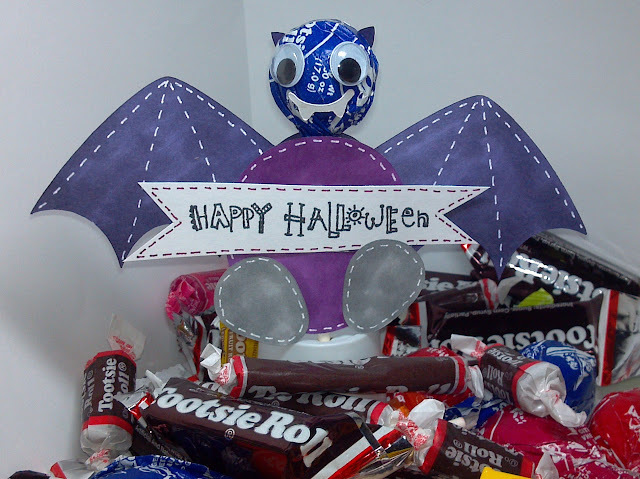 I used the bat wings, body, feet , ears and fangs from the kit, and put some wiggly eyes on, I think it came out so cute. These are very quick and easy to put together, I used Make the Cut to put two slits in the body but you can use a craft knife. I glued the middle of the body together and stamped Happy Halloween and covered the little piece of the stick, the lollipop slides right out. 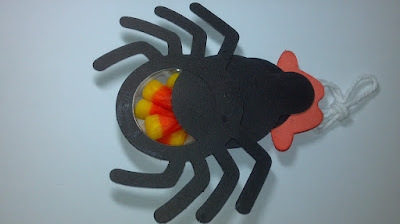 Here is a candy corn box I made using some of the svg's from SVGCuts.com. 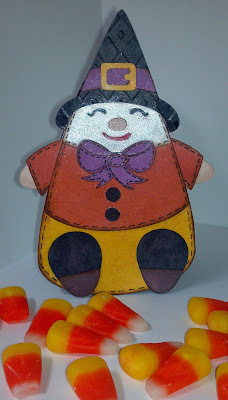 I used the pie slice from the Crisp Days of Fall Kit, the candy corn from Vintage Halloween Party Bags and to make the candy corn look like a cuddly character I used cuts from Halloween Cuddly Friends. I think it came out so cute. For the cuddly candy corn I cut everything out on white cardstock and used glimmer mist and ProMarkers to color the pieces. Here it is opened with some candy corn inside. I finally got to put together the haunted house from SVGCuts.com, I have to say Mary is amazing, I love her kits. Her directions and videos are great, so easy putting her kits together. I really enjoyed doing this project, not much to talk about just followed her video and added a couple of mine ideas and it was done. I have to say I love the Martha Stewart's Elegant Witch Designer Paper, it's just awesome, I used it on the center house and as accent pieces. 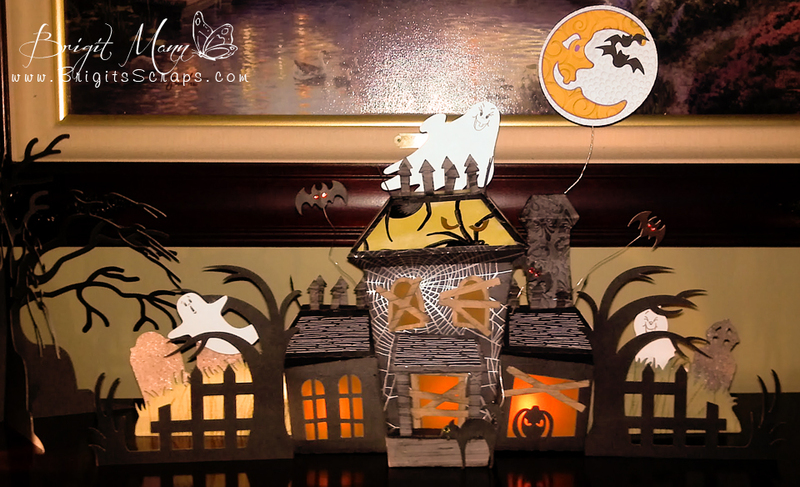 The side trees, fence and one of the ghosts came from the Haunted Hemlock Cards Kit and the moon is from Vintage Halloween Party Bags Kit, the rest is from Cricut's Happy Haunting's Cartridge.